Known as the “Kinni” by those who enjoy it, the Kinnickinnic River is a spring fed, cold-water stream 22 miles in length surrounded by a picturesque watershed of 174 square miles. It rises north of Interstate 94 in the Town of Warren in St. Croix County, Wisconsin and flows generally southwest through River Falls, until it empties into the St. Croix River, north of Prescott. Due to its exceptional water quality and self-sustaining, bountiful trout fishery, the Kinni is classified as an Outstanding Resource Water and a Class I Trout Stream. The river is framed by a landscape with memorable views, ranging from gently rolling farmland in the upper watershed to a spectacular limestone bluff canyon on the lower river from River Falls to the confluence with the St. Croix River. The Kinni and its uplands are also home to a diverse set of unique and exceptional plant and wildlife habitats. Because of its remarkable natural and scenic qualities, area residents and visitors from all over the world form special, lifelong connections with the Kinni and its environs through fishing, kayaking, hiking, birding, hunting and photography. It is joined by several spring creeks along its course (including Parker Creek, Kelly Creek, South Fork, and Rocky Branch). On a typical day, the Kinni flows at 90 cubic feet of water per second. See real-time data from the U.S. Geological Survey’s river gage. Its feeder creeks are cold and clean, containing wild native brook trout, important spawning areas, wetlands, and many springs arising from under picturesque limestone outcroppings. 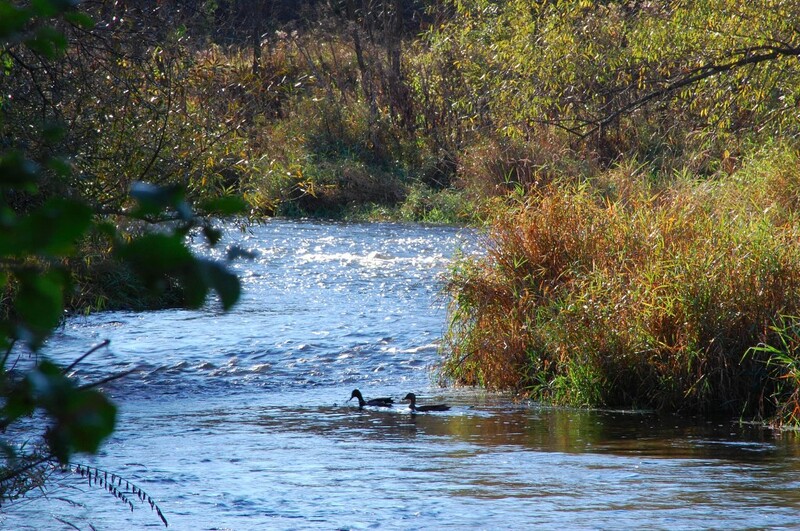 The landscape is home to deer, wild turkey, pheasants, rabbits, ducks and other wildlife. Many public accesses and other lands are available for anglers and others who want to enjoy the river. See the Public Recreation Map (PDF).